I’ve been looking around for a polo-shirt pattern for a while now. I love polo-shirts… In the winter I wear them with jumpers, in the summer I wear them on their own! I LOVE them! Last summer had me in short sleeved shirts as I hadn’t tried tshirts yet. Now I’ve got some tshirts, it’s time to try a polo. 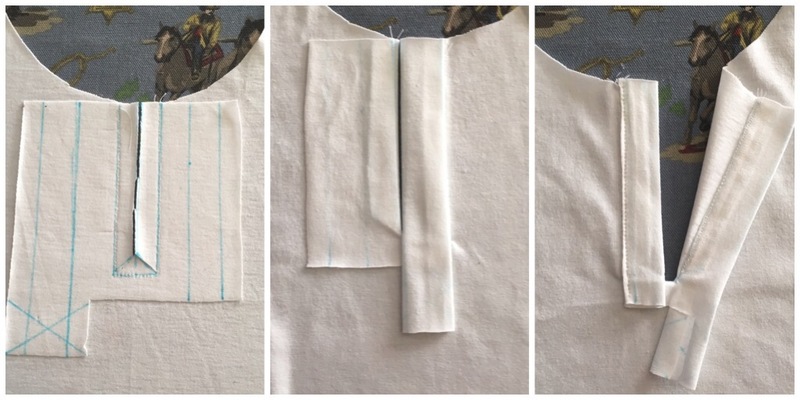 I rifled the internet and found these really helpful tutorials on drafting a collar and collar stand and drafting a cuff placket which I turned upside down and used for a neck opening placket. 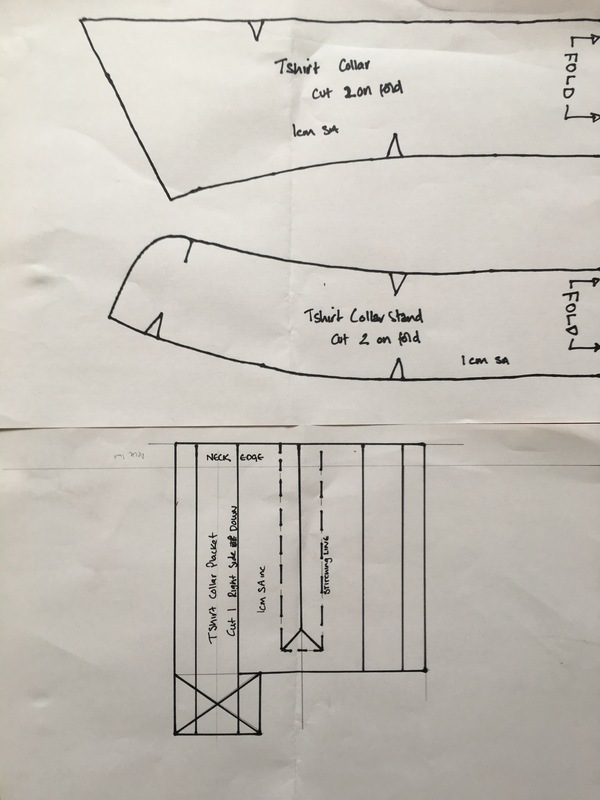 I used the neck band pattern piece from my tshirt pattern as the guide to start drafting my collar. Then I cut them out and started sewing. 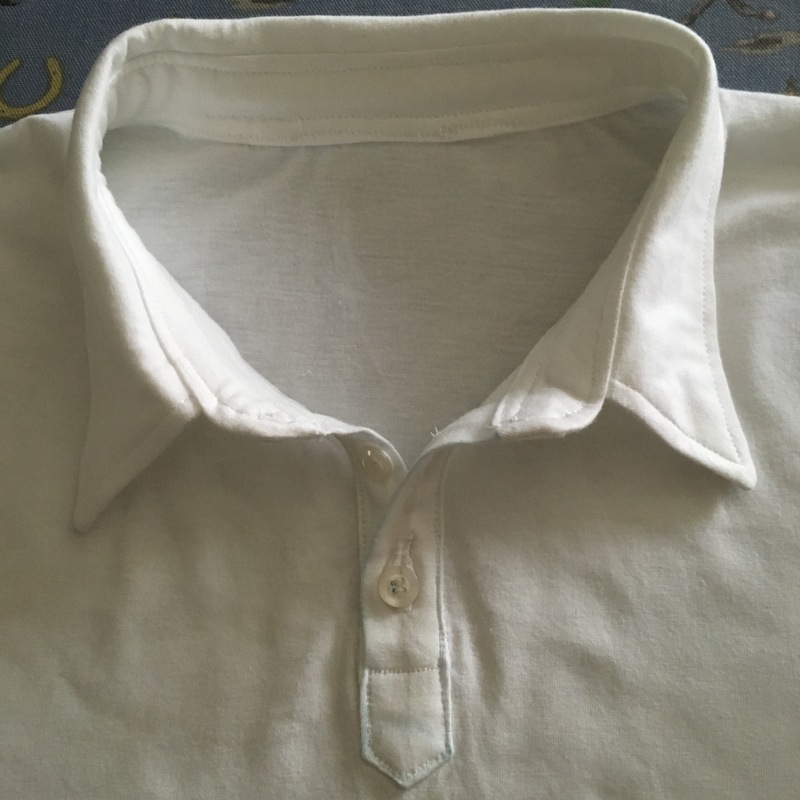 There must be an easier way, but I made and attached to collar just the same as a normal shirt collar. I took it slowly and pinned a lot. The great thing about tshirt jersey is how easy it is to ease the shapes together. 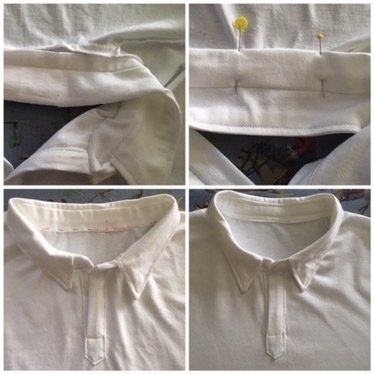 In a rare fit of dilligence I even basted the inside collar before stitching-in-the-ditch & top stitching. After a great practise run with the button holes, the second one jammed up a bit on me. I’m planning on wearing this top to my tap dancing class, so hopefully the attention will be on my feet, not my button holes! I ran up the sleeves and sides on my overlocker. Finished the sleeves and hem with the twin needle on my regular machine. Over all, I’m very happy with how it turned out. Definitely wearable. It’s in the wash now, so hopefully I’ll get it dry in time to wear to my tap class. Remember to change to jersey needles. 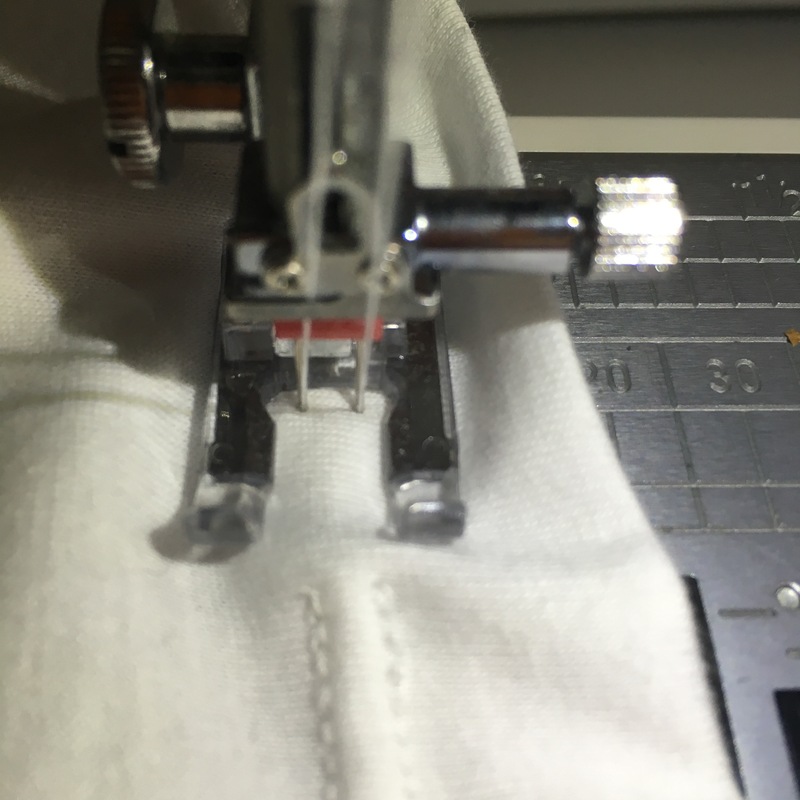 Stretch stitch &/or 3 thread overlocker. Previous Previous post: Let’s Get Ready To Ruffle! 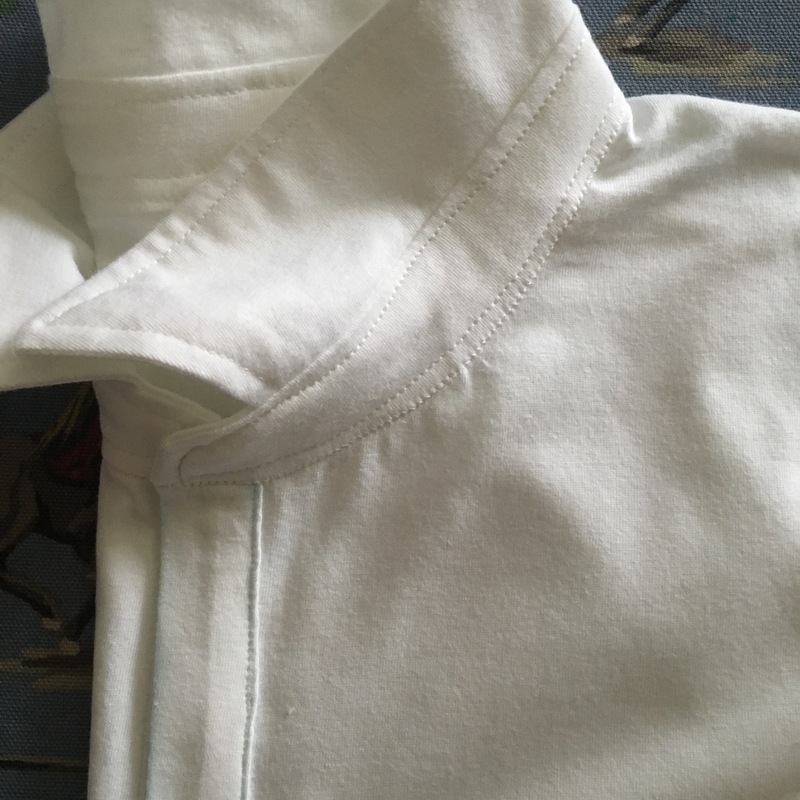 How does the straight stitch on the collar work out? It’s great, it doesn’t get any chance to stretch or snap as it’s always open when I take it on & off. Plenty of washing & tumble drying and still holding strong!